There is an astounding array of cleaning products available at your local store, online, and probably just sitting under your sink. Does it matter what you use to clean up after someone in your family has been ill? Absolutely. Today's post will help you pick the right product for your clean-up requirements. Hospitals clean with great attention to what organisms caused illness within that patient room. The pathogen could be a virus, a bacteria, a fungus, or other microorganism. Each pathogen has its own unique characteristics that dictate the kind of cleanser needed, the frequency of cleaning required, and many other factors. Even though some of the organisms causing hospital-acquired infections are different than those that cause our typical community-acquired infections, we should use this same type of approach in our home cleaning. First, let’s learn about the viruses and bacteria that cause most of our sick days. This post discusses diagnosis, symptoms, and details about illnesses that are not intended to be taken as medical advice. Always discuss health issues with your doctor. After someone in your home has been sick, one of the first things you want to do is clean up. But what needs to be cleaned? And what cleaner is needed? These are some critical questions that can be answered with a little help from the cleaning professionals in a hospital. 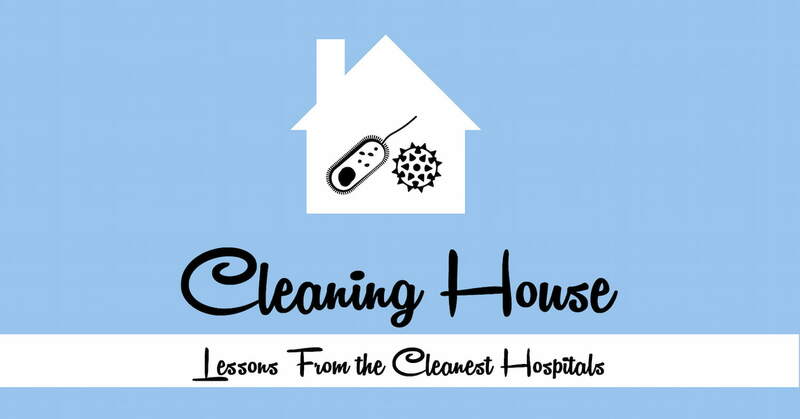 Let’s bring some of the lessons learned from hospital cleaning home to our own homes as we clean house!